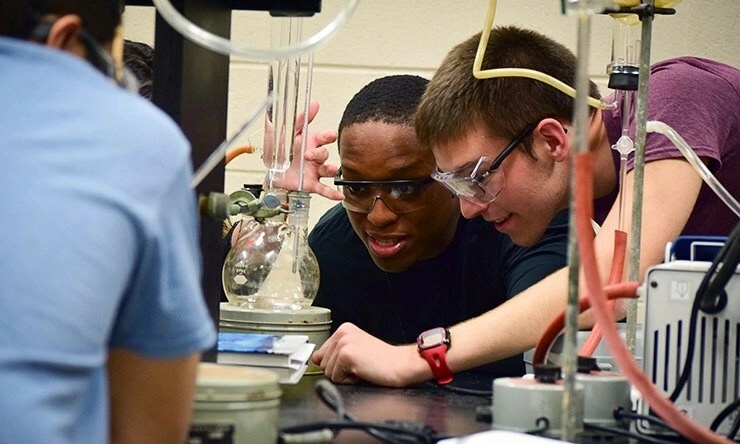 Joseph Barnes (right) participates in a Chemistry Lab at Benedictine College. Joseph Barnes is a current junior at Benedictine College from Spearfish, S.D., and Gregorian Fellow studying Chemistry. Many of our Gregorian Fellows had opportunities to participate in top internships around the country. Here is his experience of participating in an exclusive Science Undergraduate Laboratory Internship in Idaho Falls, Idaho. I was a SULI (Science Undergraduate Laboratory Interships) intern this summer, and my job was to investigate the hydrophilicity (water-loving tendency) of various concentration PEG (poly(ethylene glycol)) solutions. Our research will likely lead to a publication in a peer-reviewed scientific journal. In addition to my main research, there were also several leadership development opportunities, such as a StrengthsQuest workshop, throughout the summer. I also had an opportunity to explore Idaho Falls, specifically hiking in the surrounding mountains.